Tag Archive | "Marxist theory"
This is a labor of love. In the US, today is the Labor Day holiday. Happy Labor Day. Many small business owners love Labor Day and all holidays because business slows down so they can do extra work and get caught up… or maybe even ahead. Why in the world would someone be happy that they get to do extra work on a holiday? Because they love the type of labor they do. 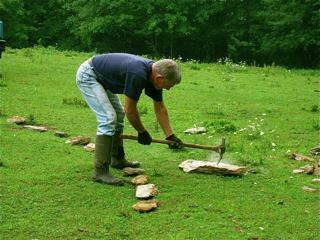 This is why today Merri and I are out working on one of our meadows…improving and enjoying the day and its Labor. This is why the theme in our business courses is to turn your passion into profit. Labor Day is a big day. Perhaps it should be a greater celebration than it is. Labor Day can give us one of the most important investing and business clues of all. Labor is defined in the dictionary as “1. a. Physical or mental exertion, especially when difficult or exhausting; work. How very wrong. Labor is giving…a part of the human existence that we need more than we can imagine. I learned this the hard way in Ecuador, a decade ago, when the Ecuadorian economy stopped. The country ran out of gas. All the banks were closed and accounts frozen. Yet everyone…almost…came to work…even though there was no money and they could not get paid. Hotel workers showed up for work… even though there was no salary check. 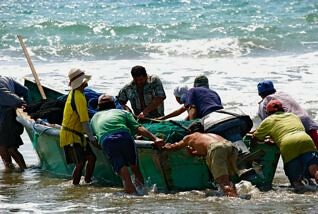 Workers like these fisherman who park their boat in front of our Pacific condo kept right on working even though their money and ability to be paid were gone. This is when the realization hit me. People want to work. We humans need to give. This is half of our natural existence… to give along with the need to take. This is the universal principle give…take…give…take. Give and take, are each parts of the whole. They go together and when either is lost missing, a great imbalance begins. Labor is the lack of slavery and dependence. It’s as bad to just receive without giving as it is to work without receiving. From the moment we learned this, Merri and I changed the focus of our Land of the Sun Foundation which had just been giving to the poor. 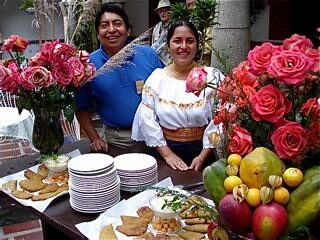 Meson de las Flores is owned by our foundation and helps people like this community in Topo Grande. 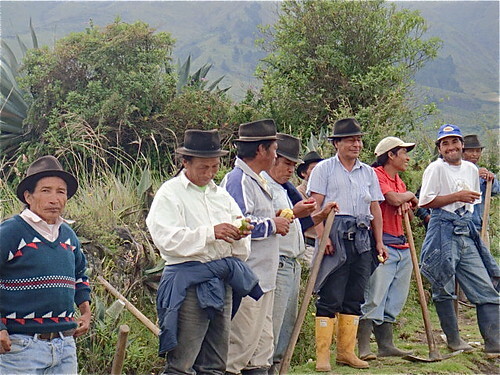 Here are workers from a small Ecuador village, “Topo Grande” supported by workers at our hotel. They are redoing their community owned source of water to bring it safely and clearly to all parts of the village and the village school as well. This is how it is with investing and business…a give and take wholeness. During the 40 years I have been writing and speaking about global business and investing, I have watched some investors make fortunes while many people lost. The winners, though asked “What will this labor provide and how much will it receive for the giving?” instead. The winners had the profit motive for sure…but through giving. Their successful outlook was full and complete. Next time you look at an investing or business idea, think about the problem it solves first. What labor does the business or capital provide? Then ask about the profit. Good investment and business opportunities contain both seeds…for giving to the market and for receiving from the giving. Finally, if you focus on opportunities in areas you love, you get a bonus. You become involved in whole ideas that are good for others, profitable and satisfying to you and fun! Then work is not labor but love. Every Labor Day I like to share a poem by the great poet, Khalil Gibran. He stated this thought about labor better than I in his poem (one of my favorites) The Prophet when he wrote about work. Here is that part of the poem with our best wishes for a fulfilling Labor Day. For to be idle is to become a stranger unto the seasons, and to step out of life’s procession, that marches in majesty and proud submission towards the infinite. You have been told also life is darkness, and in your weariness you echo what was said by the weary. And when you work with love, you bind yourself to yourself, and to one another, and to God. Often have I heard you say, as if speaking in sleep, “He who works in marble, and finds the shape of his own soul in the stone, is a nobler than he who ploughs the soil. Merri and I wish you wonderful labor wherever you are. Our course Tangled Web… How to Have an Internet Business can help you create your own internet business. A clear mind and healthy body are also vital assets… plus a second language is a powerful diversification tool.